When you want to bring galactic style to your look in a subtle way or add a new jewelry piece to your Star Wars charm bracelet, look no further than our Star Wars charms. 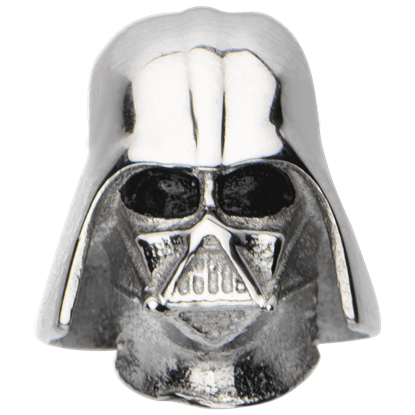 Shop here for an incredible variety of Star Wars jewelry charms in stainless steel, silver, and other high quality materials, all perfect for creating or accenting your jewelry collection. From 3D BB-8 droid charms to Death Star dangle charms and Darth Vader helmet charms, we have it all. Shop Star Wars jewelry for the Rebels, those loyal to the Empire, and even members of the First Order here. Many of our Star Wars character charms have the face or shape of the iconic heroes and villains that populate the galaxy far, far away. Whether you string them on your favorite necklace cord or chain, or add them to your favorite European style bracelet, our licensed Star Wars charms can provide a unique accent to your everyday look. BB-8 is an astromech droid who accompanies the Resistance Commander Poe Dameron on several missions. 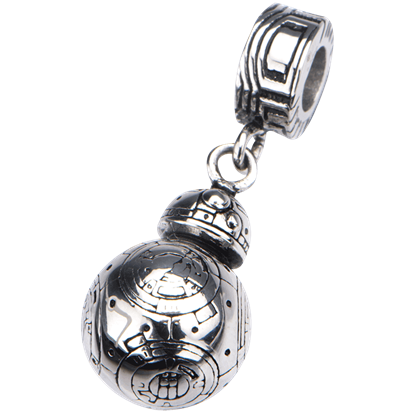 This BB-8 Stainless Steel Dangle Charm is a delightful addition to a charm bracelet, necklace, or any Star Wars jewelry item. When BB-8 and Poe Dameron are separated on Jakku, the plucky astromech droid enlists scavenger Rey to help return to the Resistance. 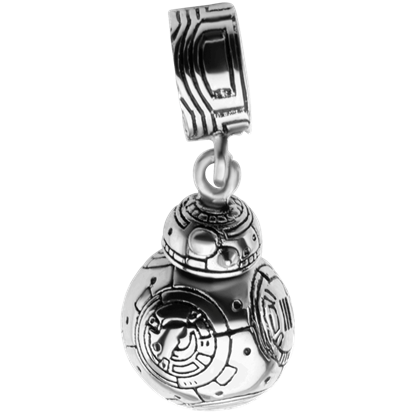 This BB-8 Sterling Silver Dangle Charm makes an adorable focal piece for any bracelet or necklace. Trained since childhood in combat and survival, Boba Fett became one of the most feared bounty hunters in the Star Wars galaxy. 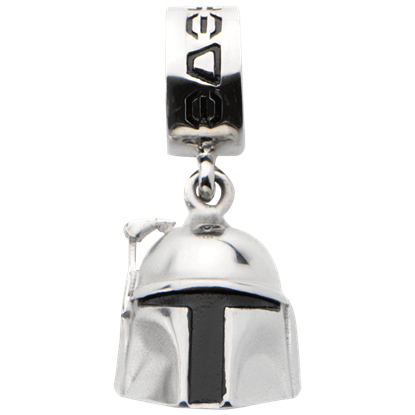 This Boba Fett Helmet Dangle Charm makes a notable addition to any bracelet, necklace, or accessory. Evasive, taciturn, and deadly, the Mandalorian bounty hunter Boba Fett instantly became a cult favorite of the Star Wars franchise. 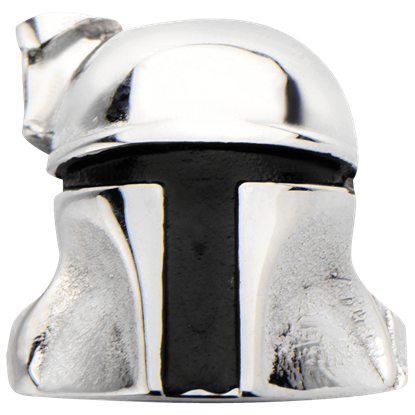 This Boba Fett Helmet Slide Charm makes a striking addition to any bracelet, necklace, or accessory. Protocol droid C-3PO and his astromech droid buddy R2-D2 are beloved recurring characters and comic relief in the Star Wars franchise. 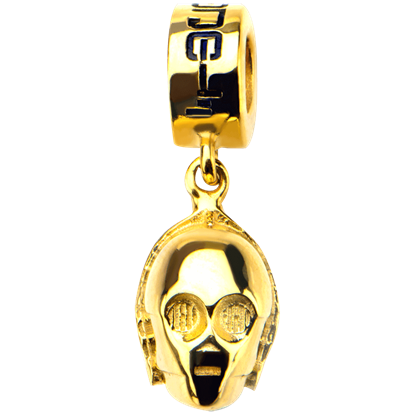 This C-3PO Face Dangle Charm makes a gleaming addition to any bracelet, necklace, or accessory. Although he only speaks in grunts and roars, Chewbacca, best friend of Han Solo, is a beloved character in the Star Wars franchise. 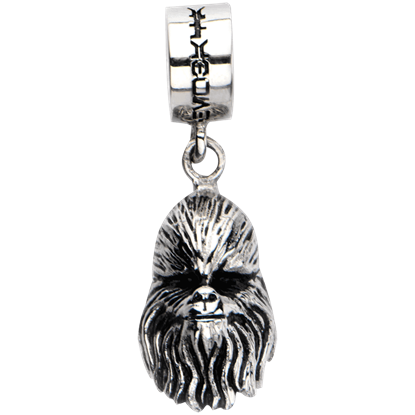 This Chewbacca Face Dangle Charm makes an adorable addition to any bracelet, necklace, or accessory. Chewbacca is a Wookiee from the tropical forested planet Kashyyyk. He is the copilot and mechanic of the starship Millennium Falcon. 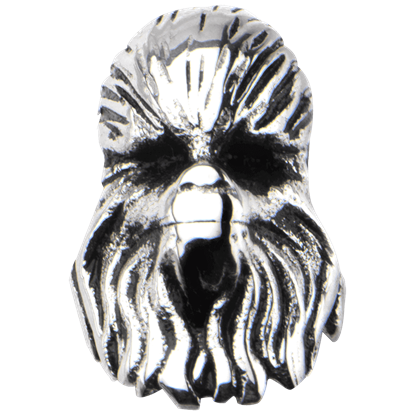 This Chewbacca Face Slide Charm makes an impressive addition to any bracelet, necklace, or accessory. Wearing a mask and armoured suit to sustain him, Anakin Skywalker takes the name Darth Vader when he embraces the Dark Side. This Darth Vader Black Dangle Charm makes a formidable addition to any bracelet, necklace, or accessory. Perhaps Darth Vader has started taking fashion advice from Captain Phasma, as he departs from his more traditional black outfit. 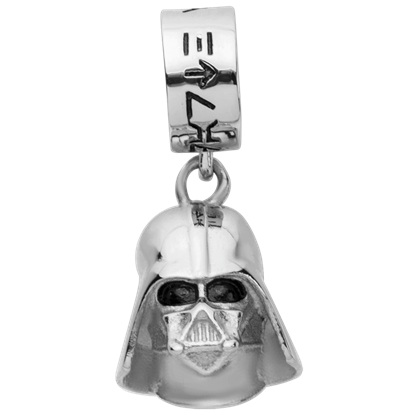 This Darth Vader Helmet Slide Charm makes a powerful addition to any bracelet, necklace, or accessory. Abandoning the discipline of Jedi training for the raw emotions of the Dark Side, Anakin Skywalker became Darth Vader. 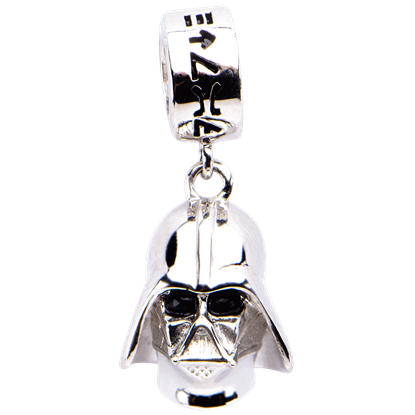 This Darth Vader Stainless Steel Dangle Charm makes an iconic addition to any bracelet, necklace, or accessory. 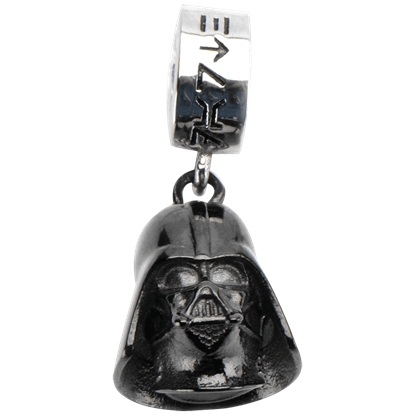 Add some Sith Lord swagger to your look with this Darth Vader Sterling Silver Dangle Charm. With a striking design inspired by samurai armor, this Star Wars charm makes a terrific addition to any bracelet, necklace, or accessory. Built by the Galactic Empire, the Death Star is a superweapon capable of destroying planets with a concentrated laser. 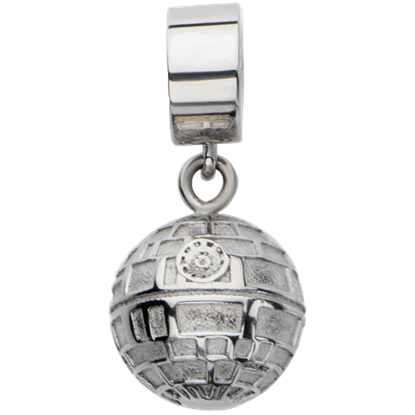 This Death Star Stainless Steel Dangle Charm makes a stellar addition to any bracelet, necklace, or accessory.